Rs 100 on Weekdays and Rs 120 on Weekends. Abroad – Singapore, France, Thailand, Mexico, Hong Kong and South Korea. 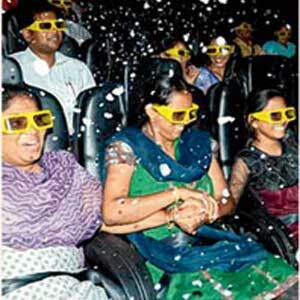 An entertainment presentation system in which films are shot in 3D and are combined with physical effects. These include simulated effects of wind, rain, lightning, aroma and fire. The movie experience is set to change for viewers. The line between reel and real will get blurred with the city set to get its first 7D theatre – Amazing 7D Rider Cinema. Movie with titles such as Rescue, Prehistoric Adventure, Roller Coaster, Ice Fighter, Predator Attack, Haunted House Hard, Deep Sea Track, Path Finder Snow and Pirates will be shown when the theatre opens on April 28. The new Saheed Nagar theatre will combine the magic of 3D with simulated physical effects of wind, lightning, rain, snow, fog, bubble, air blast on face, aroma and fire in synchronisation with the film clips, said Ankur Maheshwari, whose firm set up the 7D facility at the theatre. He also said that all the films to be screened would be family-oriented. You can buy tickets from www.bookticketnow.com.